In shock decision, Yokohama court halts SDF night flights at base shared with U.S.
YOKOHAMA - The Yokohama District Court on Wednesday ordered the government to suspend nighttime flights by Self-Defense Forces aircraft at the Atsugi base near Tokyo due to excessive aircraft noise, but rejected the plaintiffs’ demand to ground U.S. military planes. It is the first court ruling to suspend flights since noise pollution suits involving air bases started being filed in the 1970s. The base is jointly used by the U.S. Navy and the Maritime Self-Defense Force. 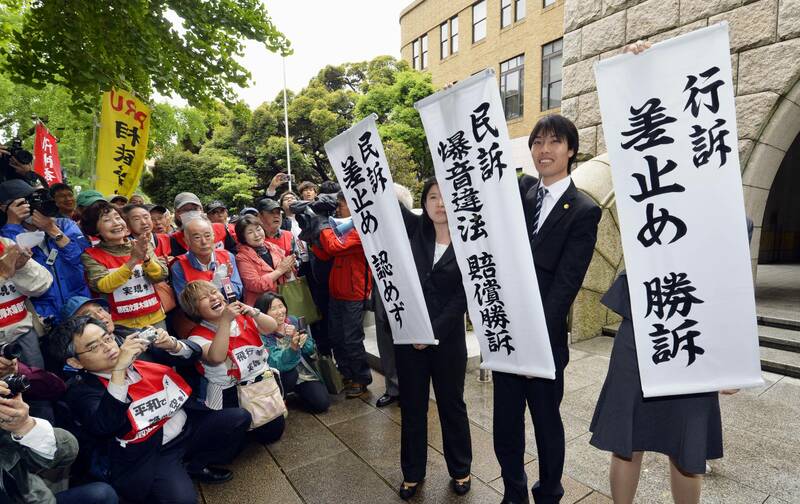 In the landmark ruling, presiding Judge Hiroyuki Samura urged the government to pay about ¥7 billion in damages, which the Justice Ministry said is a record amount for noise suits involving military bases. The suit — filed in 2007 and the first to seek the suspension of flights and the banning of U.S. military aircraft — is the fourth since 1976 involving Atsugi, which occupies roughly 5 million sq. meters of land straddling the densely populated cities of Ayase, Ebina and Yamato in Kanagawa Prefecture. The roughly 7,000 plaintiffs in Wednesday’s suit hail from eight cities, including Ayase and Yamato. They sought an end to nighttime and early morning flights at the base, saying the noise is a violation of their personal rights as guaranteed by the Constitution. They live in areas with a noise level greater than 75 on the Weighted Equivalent Continuous Perceived Noise Level, an international index for gauging airplane noise. Past court rulings have determined that the government should pay damages to people living in areas with a noise level of more than 75. Complaining of intense aircraft noise from the frequent takeoffs and landings of U.S. military and SDF planes, the plaintiffs asked for monthly compensation, which includes future damages, of ¥23,000 per person. The plaintiffs emphasized that the defense minister ultimately controls the operation of SDF jets and has the authority to approve U.S. military use of the base’s 2,400-meter runway. The government countered that the noise is within tolerable limits and has been mitigated by soundproofing measures it has taken. In the three previous lawsuits, courts said the government is liable for the noise pollution and ordered it to pay for past damages, but not future damages. 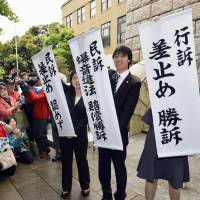 The Tokyo High Court, in the third lawsuit, ordered the government to pay more than ¥4 billion in damages to residents around Atsugi base.